Whenever I get a chance to fish, I won't hesitate. 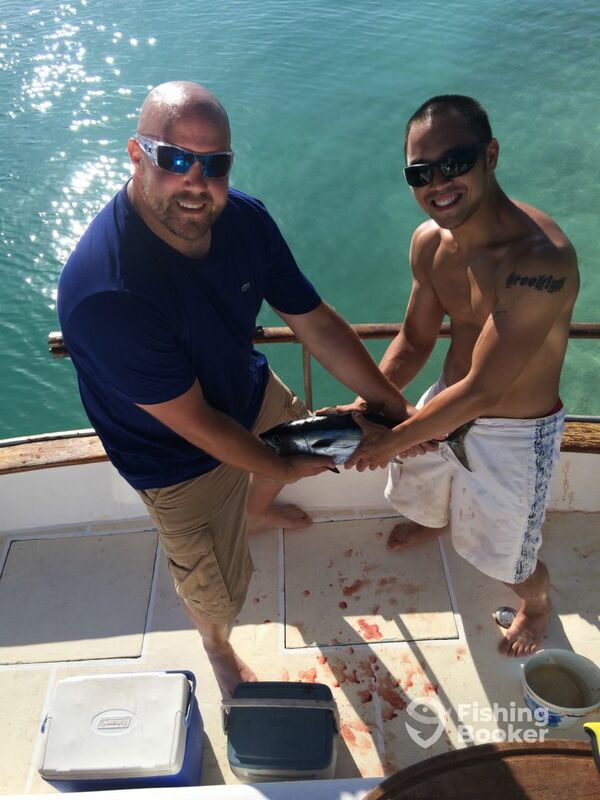 So when you book with me, we'll have a few common goals; be in the great outdoors, have fun, and catch fish! We troll mostly on the deep blue ocean, having 2 rods & reels out as well as a hand line. However, depending on the weather, we go deep as well, or stay near calmer mangrove areas for some casting. Я – Boots in Curaçao! 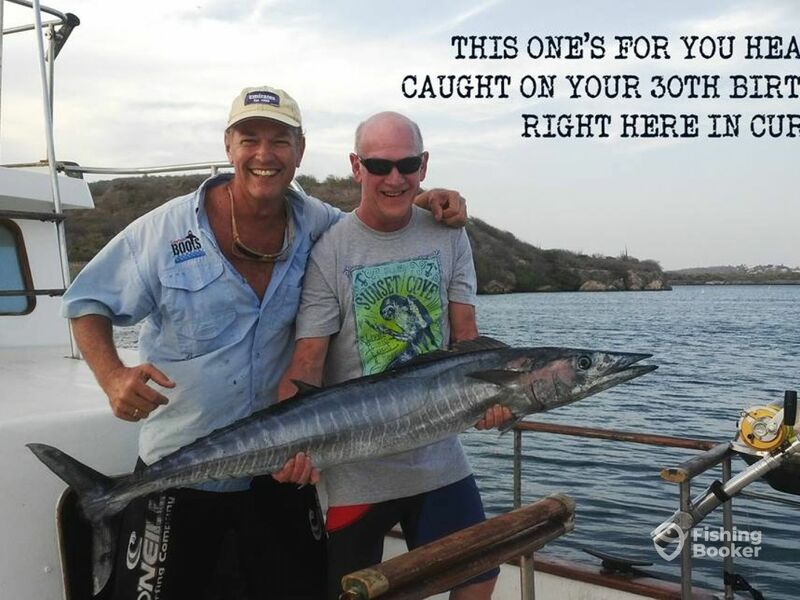 That's what we call a big Barracuda! 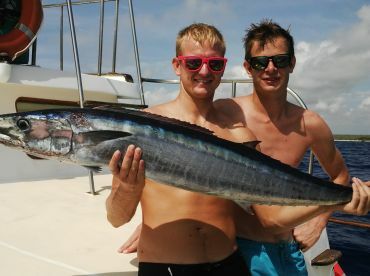 Went to curacao for 4 nights for a bachelor party,4guys all together,one thing on the itinerary was fishing with captain Boots,the boat was awsome,we caught a really nice size yellow fin(which the captain cut up on the spot for the freshest tuna We’ve ever eaten &then grilled the rest right on the boat while we took a dip in the bay)beautiful views,great way to experience curacao but the best part was meeting captain Boots,what a great guy! He took the time to explain alot,as most of us hadn’t much experience with deep sea fishing,by the end of the day it felt as if we had knew captain Boots for our entire lives,we are already planning a second trip back next year and capt Boots will definitely be on the itinerary! We are going to make this once in a lifetime experience as often as money can buy and you should too! If only all passenger were like Johnatan, Steve and the rest of the group! Thanks for the review and thanks for a great time. Come back to Curacao soon! He picked us up at the cruise ship on time and gave us an informative short tour on the way to his boat, speaking perfect English. After a safety briefing, we boarded his boat which was comfortable and clean. Cloudy skies and rough water were making it difficult to catch many fish that day, but Capt Boots did his best and tried multiple areas before the fishing day was over. 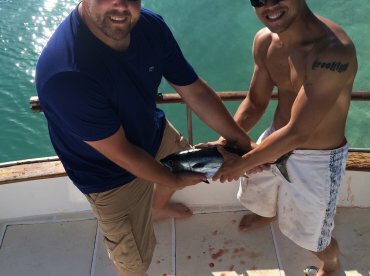 We did catch two small black fin tuna, which was a treat, too bad we couldn’t take our fish home with us, the cruise ship wouldn’t allow that if we tried. 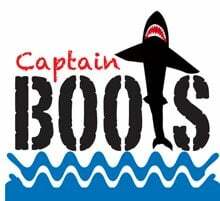 Me and my wife enjoyed our fishing trip and if we return to Curaçao, we would use Capt Boots services again. Captain is a friendly local who took us on a 1/2 day trip that included sightseeing, snorkeling, and “low-key” inshore fishing. He was great at sharing his knowledge of the island and culture, and was more than accommodating to our group, including an 81 year old. 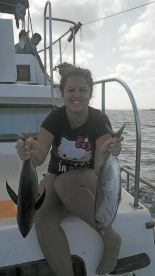 As expected, the sightseeing and snorkeling were great; the fishing not so much so…but that’s how fishing goes sometimes. Next time, we’ll skip the fishing altogether and concentrate on the sightseeing and the snorkeling; that seems to be Curacao at its best. All in all we had a very enjoyable outing. Thanks, Lars! Most welcome Robert, say hello to the rest of the crew and especially to Sissy! 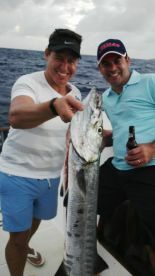 Vandecar fishing trip - Fantastic! Larz was wonderful, weren’t lucky enough to bring in the big one but the trip was great. Thank you many times over! You guys were great, thanks for having me come along ;). Although we did not catch the big one in our morning trip, we did however catch it in the afternoon and dedicated this 60 pound Wahoo to Heather who turned 30 on this day! Please come back again, you have a friend in Curacao! Just to say I’ve much appreciated the company of big Spoon, John, Brad and yourself yesterday on board of the Boots. Thanks for everything including tips received, and have a safe journey back home!